One of the great things about summer is the watermelons. Juicy, sweet, and refreshing... These are the very same attributes that make it perfect for transforming into beverages. One popular summertime beverage is the mojito. The lime and mint are absolutely delicious together and they just so happen to play very well with watermelon. This recipe is non-alcoholic (though adding watermelon juice to a standard mojito would still be fabulous). So, bring this to your next BBQ, your next picnic, your next dinnertime! Adults and kids alike are going to love it. It makes about two large glasses, so you might want to double up! The recipe is an adaptation of a cocktail I found, credited to Ina Garten, on In The Hopeful Kitchen. It is the best new drink I've tried in a long time - definitely a must-try! 1. Muddle the mint with the sugar in a glass measuring cup (you can use a mortar if you don't have a muddler). Add the water. Microwave for 30 seconds and stir until the sugar dissolves. Allow the mixture to cool (I put it in the freezer for a short bit). 2. Strain the mint mixture into a pitcher (discard the leaves). 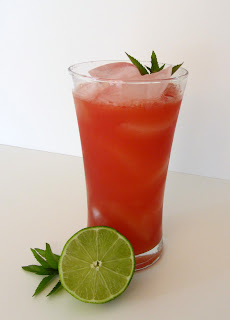 Stir the syrup together with the lime juice, rum flavoring, and watermelon juice. 3. Serve over lots of ice and enjoy!